Bayern Munich showed no mercy by beating Rottach Egern 20-2 in a friendly on Wednesday at its training ground in Tegernsee, Germany. The Bundesliga champions got the first goal of the match in the first minute, off of the boot of Kingsley Coman. Thiago added Bayern's second score in the third minute. Coman completed his hat trick after getting scores in the 13th minute and in the 16th minute. Robert Lewandowski then went on his own scoring run, scoring three consecutive goals in the 18th minute, 33rd minute and 45th minute. Rottach Egern got its first goal in the 26th minute and added its final score in the 32nd minute. [post_ads]Bayern went into halftime with a 7-2 advantage. Sandro Wagner added Bayern's eighth score in the 56th minute. Thomas Mueller put in a score in the 58th minute before netting Bayern's 10th goal one minute later. Maximilian Franzke scored yet another Bayern goal in the 62nd minute before Wagner scored another goal in the 63rd minute. Sebastian Rudy added another score in the 65th minute. Wagner scored Bayern's 14th goal in the 68th minute. Franck Ribery put in another score in the 70th minute before Franzke scored his second goal of the match in the 74th minute. 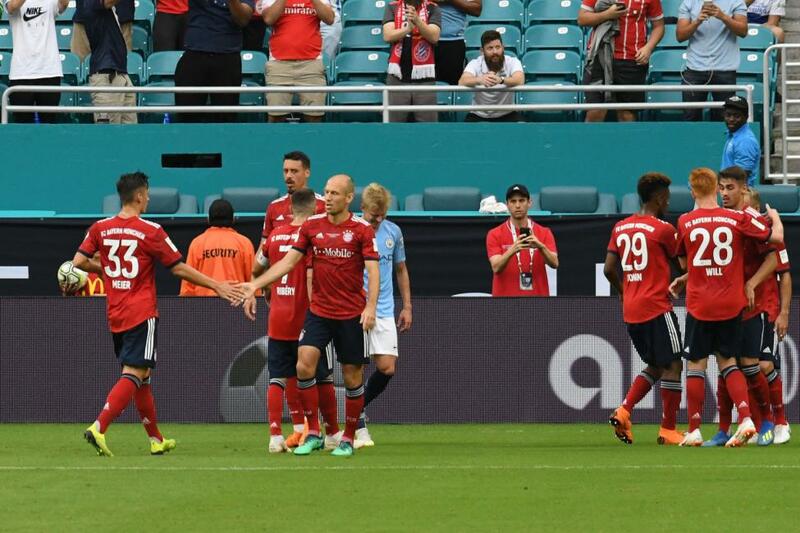 Colombian star James Rodriguez got on the scoring sheet for Bayern in the 76th minute. Joshua Kimmich put a volley into the far post netting in the 78th minute for yet another score. The final two Bayern goals were scored in the 80th minute and 88th minute by Franzke and Rodriguez, respectively. Bayern battles Eintracht at 2:30 p.m. Sunday in Frankfurt, Germany.